The Auld Lang Syne quilt block is naturally a perfect choice for a quilt to celebrate a new year. 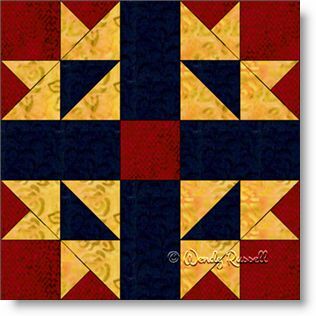 It is also a good choice when you are in the mood to practice your piecing skills to make half square triangles, and use quarter square triangle cut pieces to create an often underused patch (in my opinion) called the three quarter square triangle. This five patch block is constructed, for ease, as an uneven nine patch. The two sample quilts illustrated both use an on point setting of the blocks, but with very different results. The use of sashing strips and/or blank blocks and setting triangles give that extra pop of colour to the quilts.